Understanding Jitter and Phase Noise: A Circuits and Systems Perspective – This website provides resources and tools for readers of Understanding Jitter and Phase Noise, including dedicated sections for instructors, students, and practicing engineers. This website provides resources and tools for readers of Understanding Jitter and Phase Noise, including dedicated sections for instructors, students, and practicing engineers. 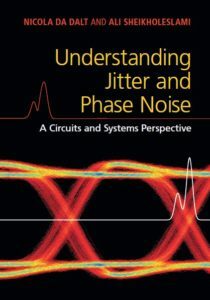 This book provides a rigorous yet intuitive explanation of jitter and phase noise as they appear in electrical circuits and systems. The book is intended for graduate students and practicing engineers who wish to deepen their understanding of jitter and phase noise, and their properties, and wish to learn methods of simulating, monitoring, and mitigating jitter. It assumes basic knowledge of probability, random variables, and random processes, as taught typically at the third- or fourth-year undergraduate level, or at the graduate level, in electrical and computer engineering. 1.1 What is Clock Jitter? 1.2 What is Data Jitter?